Ventilation and sunlight are essential factors to consider when building a house or deciding how to redecorate your home. Creating a sunroom for your home with French windows can be a great way of enjoying the outdoors without having to venture out. If a part of your home brings in natural sunshine into the house, then it’s pure blessing. The French windows sunroom can serve as a multi-purpose room for your family. It can be enjoyed as an occasional picnic area, a quiet area for quality family time or for some personal space. More than anything the sunroom with French windows will serve the purpose of enjoying some much-needed sun throughout the year. Having decided how amazing a sunroom would look inside a house. It is important to pick the right uPVC windows to decorate the place. The first thing which comes to our minds to class up a sunroom is to add French windows into the mix. French windows can add an alluring element to your home and change the course of the sunroom. Let us paint a picture for you. Imagine two tall French windows facing a lush green meadow with the sun streaming in naturally. It will be like nature’s own gift for your home. French windows are known to get that enchanting and a natural vibe to your home. The purpose is to install a weatherproof window option that allows in the maximum amount of sunlight. For this purpose, French windows work very well. French windows go from top to bottom and allow maximum thoroughfare of light and sun. As an extension, French windows with shutters can be used in order to control how much light is required and when. uPVC French windows can bring in regal and an aesthetic quality into a room. They add a sophisticated beauty to the environment. Along with the use of prolific glass the sun will sweep in quite naturally. French windows come with a lot of customizable features, ranging from the thickness and the quality of the glass to the colours of the profiles and the designs as well. French windows in your sunroom will add an ethereal charm to your home. A well-designed sunroom with uPVC French windows can add value to the overall grace and beauty of your abode. So, what are you waiting for? Design your stunning sunroom with beautiful French windows. 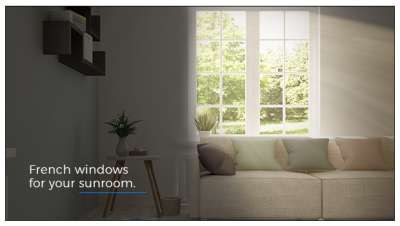 For more information on uPVC French windows explore https://aparnavenster.com .